Rose Madder: 'Green' Battery From Ancient Red Dye Plant? Rose madder, a natural plant dye once prized throughout the Old World to make fiery red textiles, might be cool once again. Chemists have developed a non-toxic and sustainable lithium-ion battery powered by purpurin, a dye extracted from the roots of the madder plant (Rubia species). 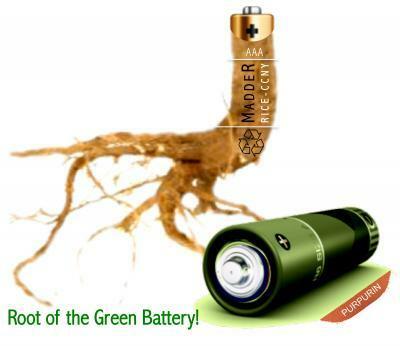 Over 3,500 years ago, civilizations in Asia and the Middle East first boiled madder roots to dye fabrics in orange, pink and red but the climbing herb might also lay the foundation for an eco-friendly alternative to traditional lithium-ion (Li-ion) batteries in the 21st century. Lithium-ion batteries are great for consumers but costs to the environment for production, recycling and disposal are high. Most Li-ion batteries today rely on finite supplies of mined metal ores, such as cobalt. "Thirty percent of globally produced cobalt is fed into battery technology," noted Dr. Leela Reddy, lead author and a research scientist at Rice University. The cobalt salt and lithium are combined at high temperatures to make a battery's cathode, the electrode through which the electric current flows. Mining cobalt metal and transforming it, however, is expensive, he explained. Fabricating and recycling standard Li-ion batteries demands high temperatures, guzzling costly energy, especially during recycling. "In 2010, almost 10 billion lithium-ion batteries had to be recycled," said Reddy. Production and recycling also pumps an estimated 72 kilograms of carbon dioxide – a greenhouse gas – into the atmosphere for every kilowatt-hour of energy in a Li-ion battery, he noted. These grim facts have fed a surging demand to develop green batteries, said Reddy. Best of all, purpurin also turns out to be a no-fuss ingredient. "In the literature there are one or two other natural organic molecules in development for batteries, but the process to make them is much more tedious and complicated," noted John. Made and stored at room temperature, the purpurin electrode is made in just a few easy steps: dissolve the purpurin in an alcohol solvent and add lithium salt. When the salt's lithium ion binds with purpurin the solution turns from reddish yellow to pink. The team estimates that a commercial green Li-ion battery may be only a few years away, counting the time needed to ramp up purpurin's efficiency or hunt down and synthesize similar molecules. "We can say it is definitely going to happen, and sometime soon, because in this case we are fully aware of the mechanism," said John. "When you can generate something new or unheard of, you think of chemistry in a different way. That a natural material or dye can be used for a battery, that is exciting, even for me."